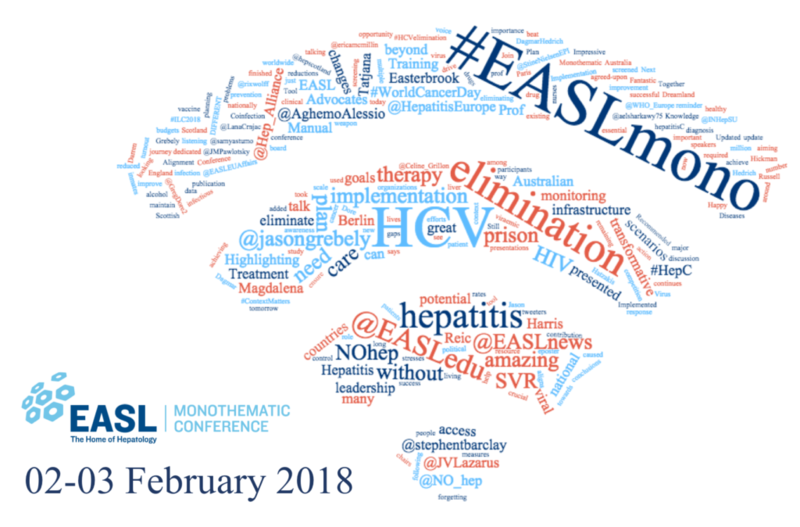 The recent European Association for the Study of the Liver (EASL) monothematic conference in Berlin was entitled “Striving towards the elimination of HCV infection”, a key topic in the field of liver disease and hepatitis since the publication of the WHO goals to eliminate viral hepatitis as a public health threat by the year 2030. What does that mean? Well, simply put, that we need to bring all our attention to bear on facing this disease and strive for elimination in full force. However, these conversations cannot continue to occur only in high-level conferences, government ministry of health decision panels, and research meetings. Engagement beyond the bubble is the only thing that will expand the conversation and, in turn, the many possible solutions. We can take the EASL monothematic conference (henceforth #EASLmono) as an example. The meeting was relatively small, as these conferences go, with 275 attendees from 35 countries. In contrast, the annual EASL International Liver Congress (ILC) this coming April can likely expect over 10,000 participants. But it’s good to start small. Bringing healthcare discussions to the internet is a way to share best-practices, critique incorrect views, disseminate research, and improve patient engagement and access to relevant information about their own health. Social media in health/healthcare has become a major topic of conversation in the last couple of years, and it could realistically be a way to better democratize knowledge. Bringing healthcare discussions to the internet is a way to share best-practices, critique incorrect views, disseminate research, and improve patient engagement and access to relevant information about their own health. The main barrier is that many people, experts especially, simply don’t know how to engage, or can’t see the value in participating in a more multi-faceted conversation. At #EASLmono there were 6 panels made up of 34 speakers presenting on various topics. The first panel on Friday was broadly entitled “Epidemiology and Prevention” though it began with Andi Hüttenmoser, a former HCV patient from Switzerland, speaking about his experience with 35 years of infection with the disease. One of the organizers remarked that “a group we don’t often hear from at [these events] is patients”. This is unfortunately true, but what a lost opportunity! There were a number of patient group member attendees in the audience as well as a presentation from the president of the European Liver Patients’ Association (ELPA) at the conference. As Dr Elsharkaway tweeted, we do owe it to the patients to work towards elimination, but wouldn’t it be dynamic-changing to also hear more frequently from these patients in real-time? Imagine the wider impact if there were not only more patients and patient groups regularly present at each viral hepatitis meeting, but also engaging from their own experiences and points (and counter-points) of view online. ELPA (@HepatitisEurope) and the World Hepatitis Alliance (@Hep_Alliance), for example, are particularly dedicated to providing a spotlight on the patient voice and are models for engagement, advocacy, and social media presence. #NOhep is another very effective social on- and off-line advocacy movement initiated by the World Hepatitis Alliance, specifically aimed at the elimination of viral hepatitis by 2030, and it actively engages people from almost every country around the world in its community for impact. During the two-day conference, conversations and commentaries sprouted amongst the audience without having to wait for the coffee-breaks every few hours. Typical discussions engaged those live-tweeting and present with others who could not attend. Though cell phone pictures of PowerPoint presentations may not be the most aesthetically-pleasing showcase of what is happening at a conference, many of the slides are designed to be summaries and citeable and it’s important for those to reach more people. Here on the right, for example, you can see a slide preview on WHO guidelines for equity of access to HCV treatment which are long-awaited, but the guidance document has not yet been released. Mentioning other key people in the field on relevant discussions is another way to continue to disseminate and critique in real-time. Tweets like these give a snapshot of what is getting attendees excited and highlights developing topics of interest. They even might predict upcoming research trends or areas of focus in the field. A major trend at this conference was, of course elimination. It was shown that between eight and ten countries are “on track” to potentially eliminate viral hepatitis in their countries. This is a perfect opportunity to take governments to task for their action or lack of action. This real-time information can be used to publically put pressure on government representatives or national ministries of health with the weight of all the experts behind it. In fact, attendees used the spotlight on these countries to foster conversation with a ripple-effect. Though 275 people were present in that blue-lit Berlin conference room, analytics show that there were over 1.8 million impressions of #EASLmono related tweets online. This means the number of times that a tweet, photo, or conversation was viewed. That’s an insane number – but if you remember from the beginning of this blog, it’s just barely over the number of newly infected HCV patients each year. That’s the point, rather than being a way to use time or increase exposure frivolously, social media engagement in health conversations is completely intertwined with the topic at hand. I know not all 275 people at #EASLmono were tweeting about the conference. But the users that did engage online (145 overall including those not physically present!) reached 1.8 million people with just 1,017 tweets. Imagine the potential connections and reach that the 10,000 attendees could create during the International Liver Congress in April! Samya Stumo is a consultant on Health Systems Research at the Barcelona Institute for Global Health (ISGlobal) and an MSc candidate in Global Health at the University of Copenhagen. She also serves as the social media coordinator and blog editor for Hepatology, Medicine and Policy and the journal’s content on BMC’s “On Health” blog.